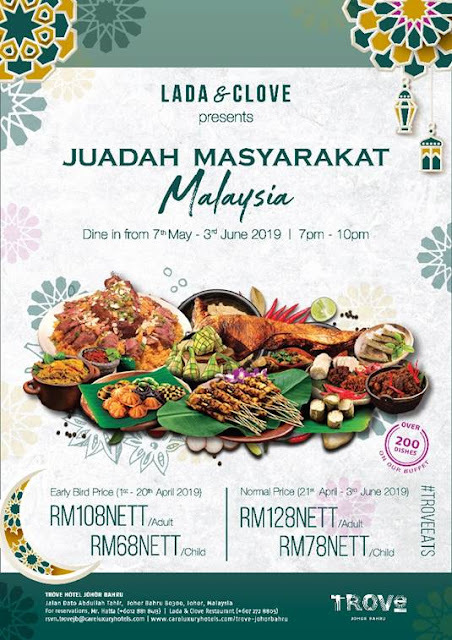 BUFFET RAMADHAN : TROVE JOHOR BAHRU PRESENTS ‘JUADAH MASYARAKAT MALAYSIA’ BUFFET DINNER FOR RAMADAN 2019 | TROVE Hotel Johor Bahru is proud to present its inaugural celebration of Ramadan this year with ‘Juadah Masyarakat Malaysia’ buffet dinner which starts from 7th May till 3rd June 2019. Over 200 of Malaysia’s favourite dishes will be featured at our live BBQ stall, hot plate counter, steamboat station, vegetarian corner and buffet line, all presented by Chef Fadzren Oyob and his talented culinary team at Lada & Clove Restaurant. Don’t miss out on our daily lucky draw in which you stand a chance to win fantastic prizes during Ramadan. 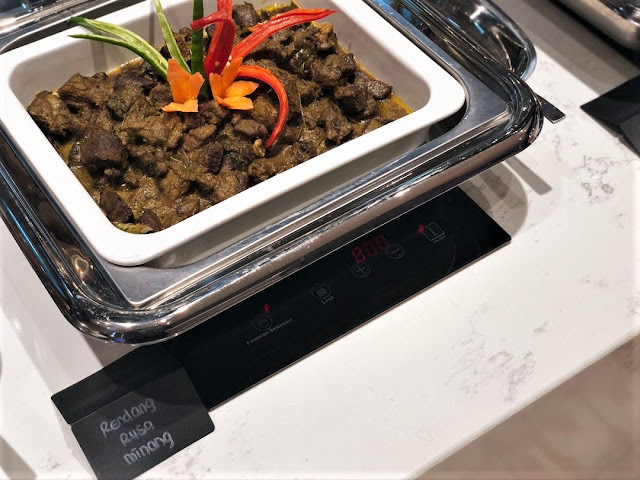 Don’t miss out on the highlights for ‘Juadah Masyarakat Malaysia’ namely Rendang Kambing Tok, prepared for a good eight hours and made with TROVE’s secret spices, aromatic lamb oxtail Gulai Warisan Utara made with a special mix of candlenut (buah keras), and Masak Lomak Burung Puyuh (quail) and Itik Salai (Smoke Dried Duck). 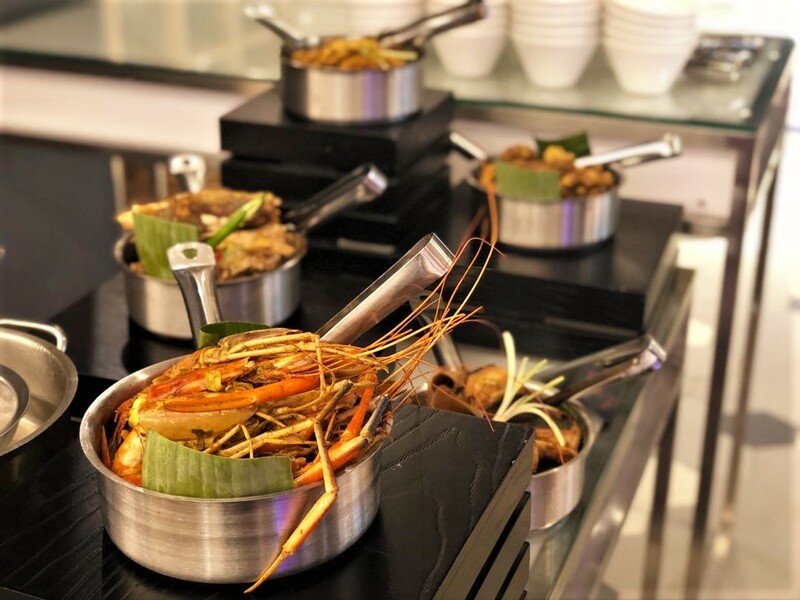 Fans of Nasi Ayam Penyet will not be disappointed with our galangal (cekur) leaf and seeds, Minang Style Vernison (Rusa) Rendang, Tandoori Quail, specially crafted Cumin Rice with Lamb with spices flown straight from the Middle East, and Masak Lomak Udang Galah (Giant River Prawn). 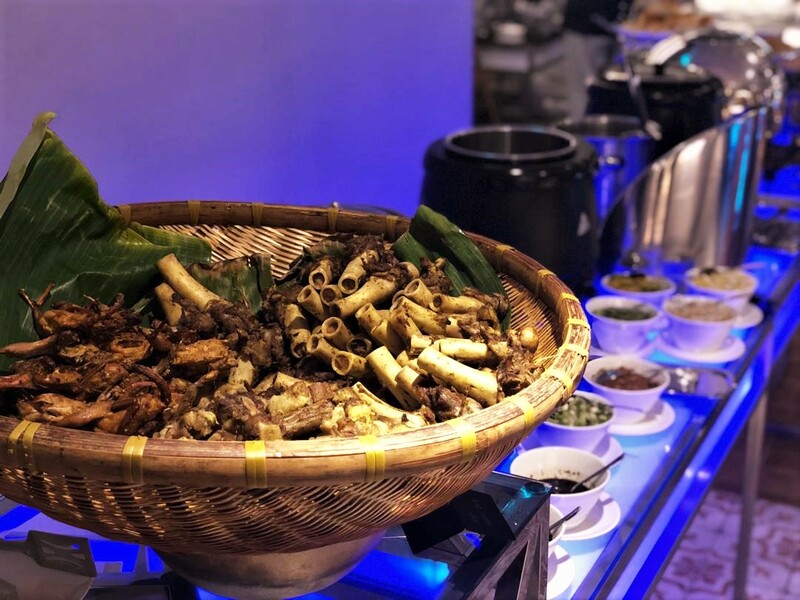 Remember to try our some of TROVE’s Signature Dishes such as Bubur Lambuk Tulang which is only served at TROVE Hotel Johor Bahru, Telur Ikan Asam Pedas Jalan Dato Abdullah Tahir and our fusion Mee Rebus Soba. Satiate your sweet tooth with our best selling 3 Sisters Cheese Cake namely the TROVE Cheese Cake, Chilled Yoghurt Cheese Cake, and the Santa Maria Cheesecake. Can’t spell Soup without ‘U’ so start off your light meal at The Pot of Soup counter with our signature Sup Gear Box (Lamb), Cream of Potato Soup, Sup Tulang Rusa, Sup Kambing Bakar Berempah, and Sup Ayam Mamak. Our Sweet Temptations Corner will feature a selection of French Pastries and Cakes, Dodol, Wajik, Bahulu, Sagun Kelapa, Ice Kacang, Apam Balik, Assorted Cookies and Candies, Mango Cendol Pulut, Putu Piring, Putu Bambu, and a recent favourite, Churros! The Early Bird price which is available from 1st to 20th April 2019 is only RM108nett per adult and RM68nett per child while the normal price is only RM128nett per adult and RM78nett per child and is available from 21st April to 3rd June 2019. For reservation or enquiries, contact Mr. Hatta at +6012 8818 413 or Lada & Clove restaurant at +607 272 8805. P/S: Kalau menu-menu di Lada and Clove ni, memang tidak pernah menghampakan, semuanya memang sedap-sedap. Yee Sis cakap sebab Sis banyak kali mencubanya. 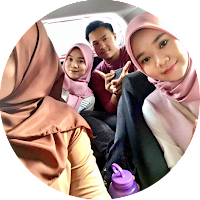 Korang cubalah . Rendang rusa minang tu.. nampak sedap je. yeee....serius sedap sangat menu2 kat trove ni!